PIC PHIL WILKINSON 'info@philwilkinson.net'www.philwilkinson.net'01316186373 - 07740444373''EN PICS''Scottish Cup fifth round replay. 'Berwick Rangers v Spatans '7.45pm kick off. ''Spartan player defeated at the end of tonight match losing to a single fist half goal. Berwick Rangers hope to cash in to the tune of more than £100,000 after making it through to the quarter-finals of the Scottish Cup. 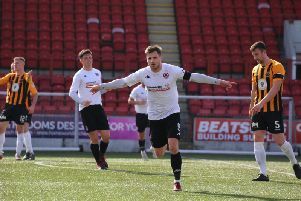 The Borderers made it through to the last eight for the first time since 1980 when they beat non-league Spartans 1-0 in a fifth round replay at Shielfield on Tuesday. That has set up a trip to Hibernian, ironically the team they also played at the same stage 35 years ago. The game, on Sunday, March 8, is scheduled to be screened live on Sky Sports, and their share of the TV money, gate receipts and prize-money for reaching the quarter-finals, means they are set for a bumper pay day. “It is a massive boost to a club like us,” said Berwick chairman Brian Porteous. “We don’t know what the final figure will be, but it will be a six figure sum, and financially that means an awful lot. The two games against Spartans drew in combined crowds totalling more than 4,500 and Porteous said he would like to thank the fans from both clubs for turning out in numbers to support the teams. Berwick won through in the replay courtesy of a first half goal from Darren Lavery, and afterwards player-manager Colin Cameron congratulated Spartans for their efforts and praised his own players for their efforts. “We knew Spartans would make it difficult for us and they did,” he said. “But now we move on to Hibs for the quarter-finals and that will be a great opportunity for the players to showcase their talents against a side playing two levels higher than us. “It will be a proud moment for me as manager to lead the team out at Easter Road, but as an ex-Hearts player I know I will get a bit of stick from the fans up there, but I am big enough to take it. “The players don’t often get the chance to play on the TV and I am sure they will all Sky+ the match and play it back afterwards. Spartans boss Dougie Samuels said his players could ‘hold their heads high’ after their cup exploits this season. “I don’t know if there’s anyone in that dressing room who’s been further in the Scottish Cup,” he said. “They can take a huge amount of satisfaction from that. “They have created a huge amount of magic memories in this Scottish Cup run and we’ve sacrificed a lot for it. We’ve prioritised the cup since new year at the expense of our own league campaign.